Welcome Bags Click the link below to request your coupon by email. Your coupon will be emailed within a day or two (we try to check daily but get busy on the weekends!) Print the coupon and bring to the national, where Yvonne will have your Welcome bag! Must attend the National to get the bag. This luncheon is open to all juniors regardless if they are a GSPCA Junior member or not, as well as their parent or guardian. A definite time and place will be announced at the National. A Junior Handling seminar will be presented by the Juniors Committee following Futurity judging. This is your chance to get valuable feedback and instruction regardless of your skill level!! EVERYONE age 8 to 18 is welcome!! And yes, bring your dog!! Participation is FREE, but it is requested that those who wish to participate pre-register in order to help plan the content of the seminar. Be a part of the GSPCA NSS Junior Mentoring Session! Your National Juniors Committee is committed to giving you the tools to make you the best possible steward of our breed and that includes understanding handling and general GSP conformation and structure. 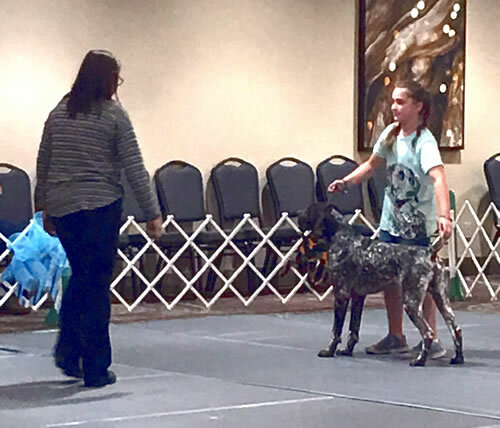 We think one way we can help is to offer you one-on-one attention in one of the best places you’ll ever have to “master” your GSP know-how; your National Specialty! Juniors will be paired with GSP people who understand junior showmanship demands AND who know GSPs. You’ll watch several classes together at ringside and discuss what you’re seeing in the ring. Participants must be between the ages of 9 and 18 and be interested in learning to show a GSP to the best of your ability! Mentoring time is extremely flexible and will be held during judging of regular classes. Further information will be posted at the show and announcements will be made the day of the event. WIN A D-FLITE TACK BOX! Purchase advance tickets via PayPal or buy tickets at the National. Do not have to be present to win! TOO LATE TO BUY ONLINE - SORRY! YOU CAN PURCHASE ON SITE, FIND BECKY! New This Year! Rent-A-Ring: Tue May 1 & Wed May 2 — $5 for 10 Minutes! Ring practice time for conformation or Obedience/ Rally - 10 minutes for $5.00! All funds go to the GSPCA Junior Scholarship Program. Times and Locations are to be determined. TOO LATE TO SIGN UP ONLINE - SORRY! FIND BECKY ON SITE AT THE SHOW!